The air pollution levels in the national capital has again gone up. Several places are under the very poor category. 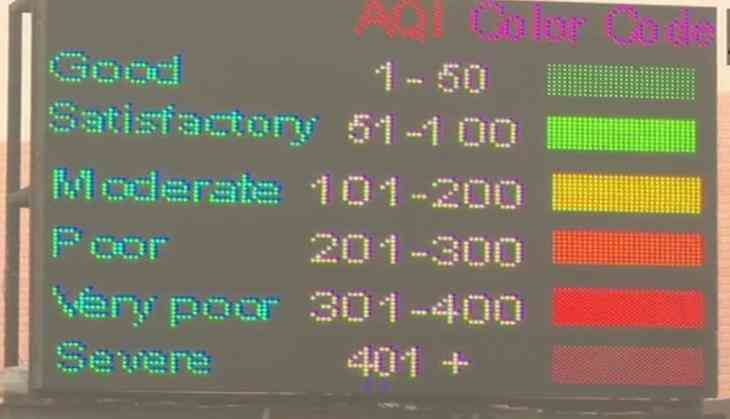 According to the state-run SAFAR, the air quality index is docking up at 319 in the morning. The weather experts have predicted that in the next two to three days, Delhi air pollution is again likely to touch upon the 'hazardous' level and rain is expected on February 5. At Dhirpur, the AQI was 333 while in Pitampura area it dipped to 'very poor' category at 341. Furthermore, AQI near Pusa Road, Airport Terminal 3 and Chandni Chowk stood at 329, 301 and 338 respectively. As per Skymet Weather, a private weather forecasting agency, on January 31 and February 1, the minimums in Delhi would hover around 9 degree Celsius and maximums could settle between 22-23 degree Celsius. "The moment Western Disturbance would start shifting eastward, winds from the North would once again start blowing over the plains which might bring down the minimums in and around 7-8 degree Celsius. However, between February 4 and 7, there's a possibility that the mercury would once again go up and minimums might settle around 10 degree Celsius," it added. Today, the minimum and maximum temperatures are hovering at 7 degree Celsius and 19 degree Celsius respectively, while humidity in the region throughout the day will oscillate between 90 per cent to 94 per cent, said India Meteorological Department. Due to thick fog across Delhi, most of the trains were rescheduled after getting delayed for at least by 2 hours on Thursday. The trains Bhubneshwar-New Delhi Durunto Express, Dibrugarh-Delhi Junction Brahmaputra Mail were delayed by 2 hours each. While, Puri-New Delhi Purushottam Express, Gaya New Delhi Mahabodhi Express, Bhagalpur-Anand Vihar-Vikramshilla were delayed by 4 hours, 3.30 hours and 2.30 hours respectively.